Put work in a gallery and it becomes art. Put it in a bin and it becomes rubbish. But put work in a bin in a gallery, and you may find it becomes both. Such is the strange new context for the many damaged pieces already piling up in the Art Bin. 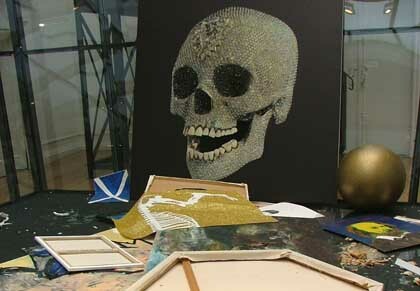 Take the glass-encrusted skull print by Damien Hirst. Put that in an auction room and it would have become money. Nearby rests a Scottish flag, one by Tracey Emin and I’m told there’s a Gillian Wearing photo, buried. It’s art, but it’s no longer theirs. Art Bin is the project of Michael Landy, an artist with a track record for trashing stuff. In 2001 he destroyed all of his own possessions in a factory production line for a work entitled Breakdown. Now he is appealing for unwanted art to fill up his latest project. That’s how I came to attempt my own sketch for the Art Bin, choosing a subject much loved by tourists. It took me a cold hour on the pebbles of Brighton beach to draw the dilapidated West Pier. The result was a sort of Art Brut pastiche. All the while I was haunted by the possibility that Landy or his representative might reject my application to put work in the bin. He has described the installation as a “monument to creative failure.” But to fail at failure would be traumatising. Determined to get my masterpiece validated by an institution, I submitted it twice, first online and later in person at the gallery. This offered a chance to see the steel framed bin first hand and press my nose up against the see-through polycarbonate panels. “There’s nothing I can say in particular aesthetically about the bin,” said Landy, who wore the look of a stern judge, it seemed to me. “It has to be physically imposing so that it pushes people kind of up against the wall. And obviously you have to see into it. “It’s kind of robust,” he added. “Bins have to be robust.” In addition to a pinstripe suit jacket he wore a pair of old running trainers, presumably for getting up and down the scaffold staircase to the top of the 600m3 bin. What criteria, I wondered, would decide a work’s acceptance to the bin. “It’s just what I like,” said Landy. Oh dear. “For some artists this is their first show,” he joked, which seemed a carte blanche invitation to unveil my amateur offering. “Oh yes, you submitted this online,” said Landy. “I turned it down.” Ouch! “I’ll try and think,” he said, looking more carefully at some of the truly artistic flourishes, or so I hoped. “I did decline you but it seems a bit mean so I’ve changed my mind. It can go in.” Success. Or should that be creative failure? To help find out, proper artists can now make their way to the South London Gallery with work they no longer want. You could say they’ll take any old rubbish. Written for Culture24. Link to follow. At what point will the bin require a bin?